Abstract: R8 was regarded as a modified version of Airwheel smart electric bikes and positioned it as the personal all-terrain vehicle. There are considerate fittings on R8 makes it stand out from other models. R8 triangle electric bike was launched by Airwheel in June 2017, along with R6 and H3. Airwheel R8 was regarded as a modified version of electric assist bike and positioned it as the personal all-terrain vehicle. There are some unique designs on R8 makes it stand out from other models. The first fitting is the super large wheels on Airwheel R8 electric mountain bike making it capable of negotiating on tough terrains like muddy paths and craggy paths. On muddy paths, the muddy water is easy to splash over the main body of and may permeate through the shell and thereby does harm to its inner component parts, which will cause the decrease in performance and even mechanical breakdown. R8's shell chooses the low-temperature painting technology making it excellent and has strong corrosion resistance, to protect and frame its wheels and keep mud from splashing it. Also, its battery and shock mitigation system are located under the saddle, which rules out the possibility of battery water penetration and enable riders to conquer various road conditions smoothly and gracefully. Out of safety, Airwheel R8 is outfitted with headlight and brake warning light. On the poorly illuminative path, ride is rather potentially dangerous. 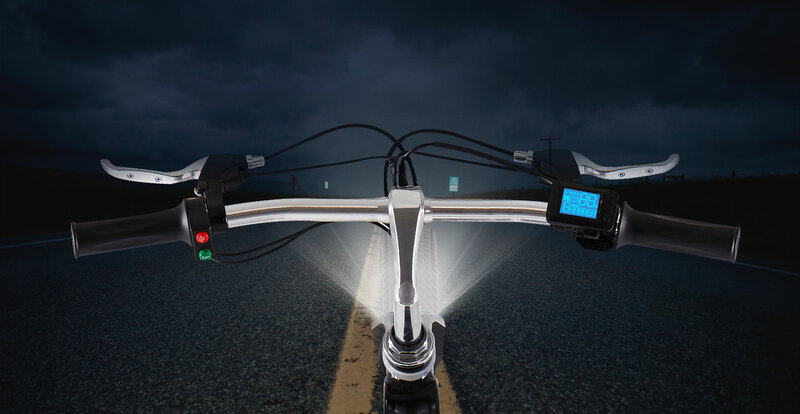 In order to guarantee the safety of the rider, R8 hybrid bike installed headlight for intensifying the illumination. The red and bright brake light in the tail will be on when you press the brake to remind the pedestrian and the vehicle at the back to keep a safe distance. In combination with the trip computer allowing riders to switch freely among the three ride modes and monitor the real-time data, Airwheel R8 safeguards your every riding. Andy is a big fan of bike…but very recently this year for the first time, he bought an Airwheel R8 triangle frame electric bike and he was riding, and it was a godsend. The proof of the pudding is in the eating. The proof of the Airwheel R8 is in the riding. Overall, considerate fittings on R8 make it stand out from other models.